Learn just what the usual tuition is for U.S. schools, and how Bryant and Stratton College - Richmond measures up. Knowing the tuition related to going to Bryant and Stratton College - Richmond will allow you to plan financially for your college years. Check out the data here to know how Bryant and Stratton College - Richmond's price measures up to other colleges and universities and if you need to arrange for tuition increases. The following table shows how Bryant and Stratton College - Richmond compares to other colleges nationally, regionally and by state. Full-time undergraduates at Bryant and Stratton College - Richmond paid $16,746 in fees and tuition in the 2017 - 2018 academic year, before adjustments for financial aid. $16,074 was the cost of tuition. $672 was the price of fees. Regrettably, this college doesn't provide any reductions to students who live in state. Look at the table below to find 2017 - 2018 school year costs. How much does Bryant and Stratton College - Richmond cost part time? Check out the Part Time Tuition & Fees page for details. Tuition and fees at Bryant and Stratton College - Richmond have not changed substantially in the last 5 years. We expect the price of fees and tuition this year will be $16,813. If costs continue to remain steady, two years at this school will cost you $33,693 and four years will cost you $67,657. In addition, you will probably have extra expenses such as room and board, transportation, and books. 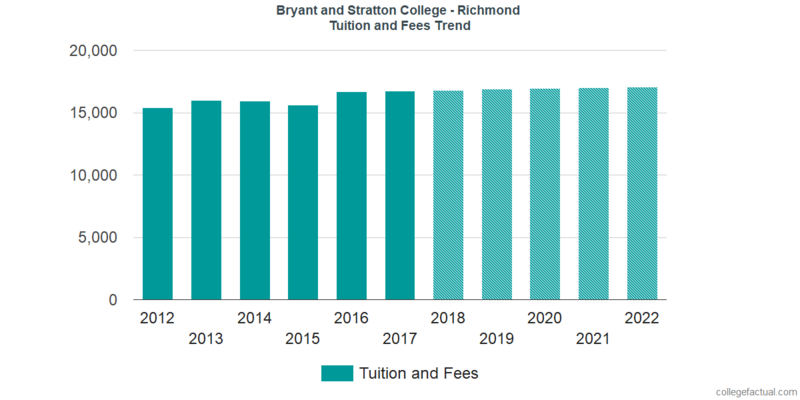 The following chart shows projected upcoming fees and tuition for undergrads at Bryant and Stratton College - Richmond. Pay attention to just how much the tuition and fees are increasing yearly. At a lot of colleges undergrads will wind up paying a larger price for their last year of school than they did for their first. Find our answers to frequently asked questions and additional information about college tuition and fees.